We hope this section will carry brief reports of formal and informal Club outings and activities. Please feel free to add comments and information. 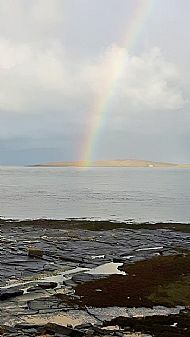 Our New Year Ramble started with rainbows and the sound of Long Tailed ducks from the Broch of Gurness car park. From there, we wandered up the road to Evie village, keeping an eye out for any flowering plants. Our ramble took us through the village, and down the road to the old harbour. 5 flowering plants were found on the walk. We enjoyed a coffee break/picnic on the beach, watching Purple Sandpipers, Ringed Plovers, Turnstones, Dunlin, etc. On our return to the car park, along Evie beach we were on the look out for Skate egg cases - 205 Flapper skates, 15 Spotted ray, 2 Blonde ray and 15 Dogfish cases were collected! Thank you to Anne for leading, and for the photos.